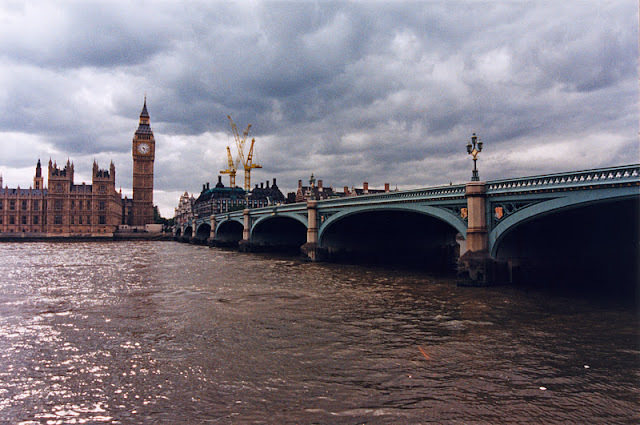 The first Westminster Bridge was built in 1750. The tidal flow is particularly strong in this area, and scour became a problem. It was exacerbated when the old London Bridge (downstream) was replaced in the 1820's. The current Westminster Bridge was designed by Thomas Page and opened in 1862. It is 252 m (826.8 ft) long and a 26 m (85 ft) wide. This is the only seven-arch wrought iron bridge across the Thames. It has architectural detailing by Charles Barry who designed the nearby Palace of Westminster. The bridge is painted green to match the seats of the House of Commons. Thames River Bridges: Westminster Bridge by Mark Yashinsky is licensed under a Creative Commons Attribution-NonCommercial-ShareAlike 3.0 United States License.